Heavenly blog! : No. 953: Dagbladet and VG may write about Oslo police and Torp's attack on me and the Heavenly blog! No. 953: Dagbladet and VG may write about Oslo police and Torp's attack on me and the Heavenly blog! Dagbladet and VG may write about Oslo police and Torp's attack on me and the Heavenly blog! Dagbladet and VG may write about Oslo police and Torp's attack on me and the Heavenly blog, religious and free speech! The so-called hate groups on Manglerud which in my opinion sets over Norwegian law, belief and freedom of expression. And try to interpret the Bible, but "Pastor" Torp help, it must go out in spagat! 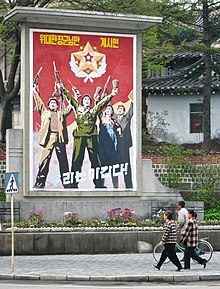 Photo of Propaganda Poster in North Korea. Everything should look so alike, wonderful and great, but it is a tragedy! There is diversity, otherness and the opportunity to express themselves without being penalized for what is happiness for us humans! Unfortunately, it is out of this disability Oslo police will try to lead us. It shows they fully to take me to court to held out the truth! Of course it is my "objective" truth. The right to have is really insulting and harassing to be deprived. Here know the police not at all what faith. And freedom of speech is for something! As I see it, then cast on to a miscarriage of justice for me and the Heavenly blog. All that I have written, spoken and said has been against a "Pastor" that are not either live or teach in accordance with God's word. And hear that it is harassment, is so far from the truth it is possible to get. Glad Dagbladet and VG will write about this so that Norwegian people as possible can get into the eyes of any police we face! Brynjar Meling has been appointed as my defender, I'm very excited! When I do not have money he-he! Only prayer, hallelujah! - If I react negatively to what someone says to me, then I am in fact a victim of my own reactions, I am not a victim of what you say to me. My feelings are my responsibility, and if I let myself insult so fail myself, says psychologist Jan Atle Andersen to echo on NRK P2. He believes that if we meet a man who has bad manners, so it is important that we take care of ourselves. - It's simple but not easy. I think that too many people are all too hårsåre and very robust, so they let themselves infringe and provoke by what I would call trifles, says Andersen, who believe that we live in offense era. If people lie awake at night and can not bear to go to work, they are victims of their own reactions, he said. - We must realize that our own feelings, is just that. They are our own. And my feelings are my responsibility. It is not you that annoys me, it is I who annoys me, says Andersen. The psychologist, who operates in conflict resolution business, it we can safely call clearly. Although I have tried to live by a motto to prioritize very carefully what I should worry about, something I even think I have become quite good at. In most contexts. Andersen challenges me to stretch myself anymore. I still think he has a point when he says about the approach he argues, that "it's simple, but not easy." All "problems" here lies in only one person, it is Jan Aage Torp. He has chosen to live in sin, and then be violated! First, a Socrates - anecdote: Socrates and a friend met an acquaintance. Socrates greeted politely, but was arrogant overlooked by the other. Socrates friend was upset over the abusive behavior: "It's terrible when he offends you in this way." Whereupon the sage remarked: "It's not me against me is more polite than him." He took responsibility for their own reactions, and refused to be infringing. He took responsibility for themselves. Muslims seem to violate a Danish cartoonist, and stuck flags and embassies on fire. It is to give a small Danish too much power! They could always "taken a Socrates". But in this sense we are Muslim head ale together; We allow ourselves to violate the minutiae. "He called me a sow," is the nothing to be offended. Better to "take a Socrates". Willy Haugli understood that "I'm very picky regarding who I let offend me." Hanna Kvanmo also understood; "I prioritize carefully until I'm angry." Some allow themselves violate easier than others. Word thus has the power that the receiver does. (Please read the statement in front again). Whoever has power over my feelings, have power over me. The power I will not give up. My feelings are just that - mine. They are not created for others. They are not something that only happens to me. They are something I do. I rejoice, and be happy. I'm angry and get angry. I have unrealistic expectations and disappoint me. It is not you that annoys me, but I. "You irritate me" is a projection - A reality distortion at 180 degrees. I blame you something I do. I'm a little crazy. But when all is wrong, then no one is noticing. We influence each other, but are responsible for their own reactions. My feelings are not just my responsibility to meet with friendly people. They are also my responsibility when I meet someone who wants to offend me. Allows you violate? The acting infringing makes even an abusive man. It is a self-harm. His problem! If you react as he wants, and allows you to violate, as do his problem to yours. Do not worry. You can "take a Socrates". If you react as he wants, so rewards you his behavior, and have probably continue with their profanity. This is the victim's contribution to conflict: He responds that bully will. Words are not dangerous. They can not hurt, kill or crush. Only "sore", "kill" and "crush". The quotation marks are important here! To believe that words can hurt, crush, stab etc are renheklet wodoo and casting spells that the vast majority (over) - believe. You do not have butterflies in my stomach, just "butterflies in the stomach". But all is wrong, and no one laughs. If you try to offend me, and I let it happen, then it is I who violate me. I take no responsibility for your own feelings. "I violate me." It is the responsibility language. It is to call a spade a spade. It is my responsibility to take care of me. If I entrust this responsibility to others, betraying myself, I make myself a victim, and becomes dependent on tølperne pull themselves together. Betrayal is supported by parent and school and anti - bullying campaigns in vain trying to get the better of bullies, instead of learning how to take care of ourselves. Expressing support and sympathy with the victim is a disservice worse than any verbal harassment. He pickled into victimhood and do not come out of it before tølperen pull themselves together. He does not. "Take care of yourself," said Socrates. If you treat me foul, then an important, I have learned to take responsibility for myself. I do this when I take responsibility for your own feelings and not let me offend. Soren Kierkegaard, from memory: "If someone tries to offend me, it's not a matter between him and me; It is an issue between me and me. I'll let me offend or not? " How did it go so wrong? What got us into blaming others for our own feelings? It seems fairly obvious: We are brainwashed by parents from day one: "If you are naughty, then mommy sad (and Dad angry). How instilled children to believe that they are responsible for their parents' feelings. Meanwhile manipulates we child to guilt: "Now I am tired / disappointed / angry etc. And it's your fault. "The guilt can sit in for life. Hersketeknikk at its most cunning. A boy who is subjected to such brainwashing can easily pull a fateful conclusion; If I have responsibility for others' feelings, so I suppose I have someone take responsibility for mine. 20 years later mistreat his sambo because he "provoked". How we do our sons to violent men. Violent men do not take responsibility for their violence. They blame it on others or on their mettle. Whoever does not take responsibility for their feelings, giving violent people the best virtuous mental support and excuse. Some lacks manners and makes life miserable for their surroundings. But this is not the real problem. The big problem is that so many disclaims responsibility for their own feelings, thus becoming so hårsåre, they crackled for a good (or bad) word. Many possible insult for trifles. They are offended until gusto with all the rights this entails: Self-pity, compassion, self-righteousness and sick leave. But Pouting is not approved basis to report sick. This is a public education task of enormous dimensions: learning that words are not dangerous, and that their own feelings are your own responsibility. That there is "insulting words", only people who allow themselves to violate.